1) end the daily search for your keys (admit it!) and other necessities 2) stop spending money on duplicates (only to find the damn scissors afterward!) 3) feel clear-minded and creative. You'll need boxes and trash bags. You know the drill, label these boxes “donate”, “keep”, and “toss”. If you haven't used something in a year, donate or toss it. Be ruthless. Call up local charities and arrange a pick up for your donations or immediately store the donate box in your car so you can drop it off at the thrift store the next time you go thrifting. If you can't easily put away all of your keeps, start to edit them by category. Assign a home for each item and put them away. Take note of where clutter forms in your house and make a plan for eliminating it. Invite a friend over to help you. They don't have emotional attachments to your items. Remember the last time you moved. Imagine an easier move with fewer boxes. Imagine the home you want to live in. Everything is easy to find and is perfectly accessible. Assign a little time daily to cleaning, organizing, and decluttering. Assign each item a "home". Keep it there. Get into the habit of putting things away as soon as you're done with them. Establish routines that will keep your organized. Decluttering is easier said than done. What do you do with sentimental items? How do you get started in this overwhelming process? I'll cover the decluttering process step-by-step for the rest of the week. 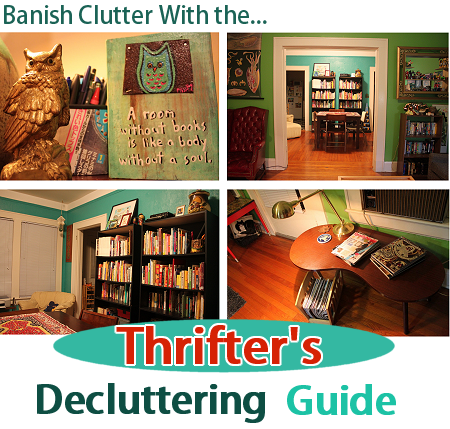 I hope you follow along and finally get your clutter under control! Share your tips, articles, and suggestions in the comments. We need all the help we can get! This is a nice reminder of what I need to do this week! "Get into the habit of putting things away as soon as you're done with them." Great tips. I'm hoping to do a thorough de-clutter session this month so this helps motivate me. And I'm glad you're keeping those robots, although they look so tough that I doubt they'd let you throw them out without a fight. You have some great tips on your blog!! Katie: I've been putting everything away when I'm done with it...except for clothes! When I find out exactly how to conquer that one I'll update with the cure! 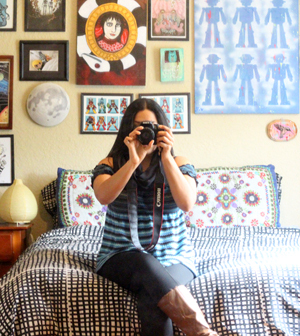 My decluttering tip is to hire someone! Stopping by via Happiness Project. when I look at something--I think use, put it away or toss it--helps to think ahead, where will I put this? will I use it? will it make me crazy? should I just get rid of it now? Dixie Mom: I'm always tempted to do just that. Desiree: I've been trying hard to stick to my lists religiously. The hardest part for me is sticking to a meal plan, kudos to you for that accomplishment! Laura: I've gotten into the same habit. It's so important to look at what we use daily to cull clutter. I now keep a box out and will occasionally add vintage items to put in my shop. It's full now, time to tag the items and send 'em off! In an attempt to maintain a little 'ongoing' decluttering, I always have an empty box somewhere that I can drop in items to donate as I come across them -- when the box is full, off it goes. I read on another blog the quote "Love it or lose it." 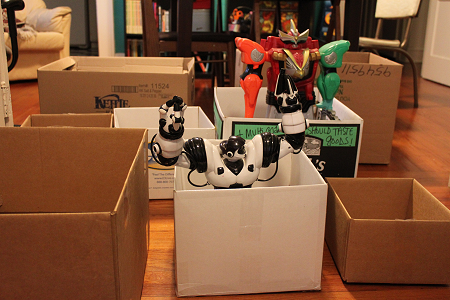 "imagine moving with fewer boxes," I do that all the time when I'm sorting through my stuff, and it works great! I also let my friends go through my donation bags before dropping anything off; everyone likes free stuff. It's so hard to remember to put stuff on their proper places as soon as you're done with them, and then the pile grows. I need to do all of this asap! Jacqueline: I do the same thing, friends get dibs on my "donation" boxes when possible. I gave a few boxes of art supplies to my artist buddies. I'm so glad they'll be used again! Love the tips; they're good ones. I'll admit to being a bit of a pack rat, but when I clean - things go! My tip for those that have a child (or maybe even for yourself), use *one smallish* box that is a 'storage' box. Put into it anything that you just can't bear to part with: things like be a child's treasure that's just taking up space in their room, but it will break their heart to get rid of. Keep for a bit (time range is up to you), then go through and get rid of things. A lot of good hints there. I usually just don't buy much. I really need to do this...especially with my clothes. I have GOT to find time! I'm glad you like the little collection of things on my blog! I am definitely a big fan of yours now, you're saying the exact things I need to hear. I'd like to think my life is full of "organized" clutter, but it's true there's a LOT I could part with. I'm following you now, and am looking forward to your posts! great tips! i need to do this ASAP! Great trips! I find a lot of stuff in my house that I really love but don't have a space or use for. I have a space where I collect these things and every week or two I take a moment to review the pile. I decide if some of the items may find a loving home with a friend or family member and the other stuff goes to the thrift shop.